The TVS-873e features SSD caching, and also supports optional M.2 SATA 6Gb/s SSDs. Using an SSD cache boosts overall system performance, and is perfect for improving the overall workflow of random IOPS demanding applications such as virtualization. QNAP's Qtier™ Technology empowers the TVS-873e with auto tiering that further helps continuously optimize storage efficiency across M.2 SSD, 2.5-inch SSD, and high-capacity SATA drives with around-the-clock acceleration. The new Qtier™ 2.0 features IO-awareness that empowers SSD-tiered storage with a cache-like reserved space to handle burst I/O in real time, greatly maximizing the advantages of SSD. With its innovative USB QuickAccess port, the TVS-873e eliminates the complications of first-time NAS installation and provides direct access to files stored on the TVS-873e - all without needing network connectivity. Simply use a compatible cable* to connect the TVS-873e to a PC or Mac device, and use Qfinder Pro** to configure it. It is just that easy. You can also assign access rights to users for different folders to prevent unauthorised access to important files. The TVS-873e provides intelligent video management system that assists you in managing real-time monitoring, video & audio recording and playback with a wide range of customizable settings to safeguard your work environment. You can use the Vmobile app to manage monitored channels anytime and anywhere with your mobile devices, or install the Vcam app to turn your device into a network camera to instantly record to your NAS. The TVS-873e also supports QVR Pro (Beta) that integrates QNAP's professional QVR system into the QTS operating system. You can arrange a dedicated, independent storage space for surveillance data on the NAS and leverage the advantages of scalability and storage manageability from QTS. Browser Station - Enable remote access through NAS browsers to access local LAN resources without going through complex VPN setting. QIoT Suite Lite - Combines the security and large capacity of QNAP NAS while providing an IoT solution on a private cloud. It only takes three steps to quickly deploy your own IoT application. WirelessAP Station - Install a compatible PCIe wireless network card, and use your NAS as a wireless base station for easy access to NAS services and Internet connection. Mobile Apps - Simplifies file access, NAS management, multimedia experience, surveillance, and download tasks on mobile devices with QNAP apps. Yes The following are not hot-swappable: M.2 SSDs, SSD cache drives, SSDs using PCIe expansion slots. 2 x PCIe 3.0 x4 Note: Support 10GbE LAN card, USB 3.1 Gen2 (10Gb/s) expansion card, QM2 card, or PCIe wireless network card. 2 x 3.5 mm dynamic microphone jacks 1 x 3.5 mm line-out jack 2 x speakers Note: You cannot use the speakers and the line-out jack simultaneously. 2. External hard drive (EXT3, EXT4, NTFS, FAT32, HFS+, and exFAT) Note: You can purchase exFAT driver licenses on the License Center. 4. USB Wi-Fi adapter Note: This feature does not support ad hoc networks because of safety considerations. 1. iSCSI targets with multiple LUNs Note: The maximum total number of targets is 256. 3. Team folders as file center for better collaboration Note: The maximum number of sync tasks is 32. 1. Support for LXC and Docker Note: Docker containers support Bridge, NAT, and Host mode. Linux containers (LXC) support only NAT. 2. 4 free camera licenses Note: The application supports a maximum of 72 camera channels. You can purchase additional licenses on the QNAP website. 1. QVPN combines an integrated VPN Server, a VPN client, and L2TP/IPSec VPN services. 4. Monitoring of NAS devices behind NAT routers with Connect to Q’center Note: The application is available in the App Center and in virtual appliance marketplace (VMware vSphere ESXi and Microsoft Hyper-V). 1. Video, photo and music streaming to Apple TV or Chromecast using the following: NAS applications: File Station, Music Station, Photo Station, and Video Station Mobile applications: Qfile, Qmusic, Qphoto, and Qvideo Note: You must install the Media Streaming add-on app from the QTS App Center. 4. User login permissions Note: The decoding capability of the CPU and graphics card may affect playback of some video files. 3. Remote desktop for remote monitoring and accessing of Ubuntu Note: The application requires at least 4 GB of memory and installation of Container Station. 1. Designs and specifications are subject to change without notice. 2. Some features may vary by model. 3. QTS does not support DRM content, Dolby, DTS, and some IPv6 services. 4. Some data encryption features may be unavailable because of country-specific legislative restrictions. Note: Use only QNAP memory modules to maintain system performance and stability. 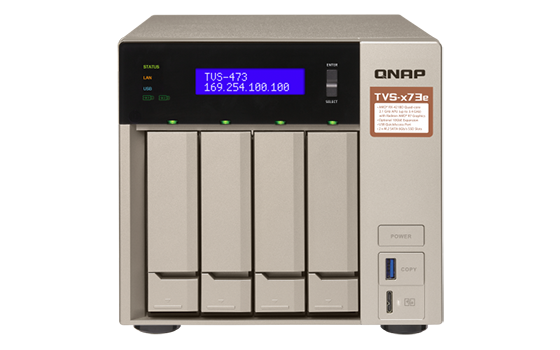 If the NAS unit has multiple memory modules, use the QNAP module with the same specifications. Dual M.2 22110/2280 SATA SSD and single 10GBASE-T 10GbE network expansion card (PCIe Gen2 x 4), Low-profile bracket pre-loaded, Low-profile flat and Full-height are bundled. SSD not included. Dual NVMe M.2 22110/2280 PCIe SSD and single 10GBASE-T 10GbE network expansion card (PCIe Gen2 x 4), Low-profile bracket pre-loaded, Low-profile flat and Full-height are bundled. SSD not included.